Let me preface all of the following by saying that I haven't yet gone out onto the greater Internet to see what the range of opinions is on this week's twin "Fall of the Hulks" releases, Hulk #21 and Incredible Hulk #608. I didn't even speak with anybody at my local comic shop (this week it was All About Books & Comics in downtown Phoenix--click for the site)--I just grabbed my variants (the regular covers come in the mail next Tuesday) and ran. I read and re-read the books whilst waiting for my Toyota to be fixed (#$&@ recalls! ), and now, finally, I'm home so I can let my thoughts be known. Both stories feature the grand assault on the Intelligencia's "Hellcarrier" (the SHIELD Helicarrier they stole after it crashed in Hulk #2, renamed by the that's-why-they-call-him Mad Thinker), with Hulk showing the Red Hulk's part of the assault (plus partner--more on him in a bit), and Incredible Hulk giving us Bruce Banner and his Avengers squad's side. The solicitation copy promised along the way we would learn Skaar's true motivations and the Intelligencia's true plan. I'm not sure this duo of issues showed either, I mean, I guess they showed the "what" of the Intel's plan, but the "why" has yet to be addressed, presuming it's anything other than the standard "bad guys want to rule the world" scenario. After the flashback, the Red Hulk boards the 'carrier, but is ambushed by Awesome Andy--I mean, the Gammadroid, whom he defeats before being defeated by the Cosmic Hulk Robot (from the Eternals series as well as Red Hulk #1 and Incredible Hulk #606). MODOK reveals that he was duped all along. Originally, Red Hulk says, the Intel meant to use Banner to power their grand plan, since they already used him--together with the power of the Cathexis Ray that created Doc Samson--to create the Red Hulk. They also experimented on Rick Jones with the Cathexis Ray, producing A-Bomb (which almost-but-not-quite negates the theory about the ending of WWH directly producing Red Hulk, A-Bomb and Samson's new self, see later). 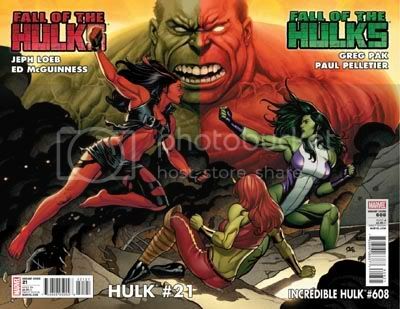 Similarly, they needed Jen Walters (who was kidnapped in Incredible Hulk #600) as the power basis for Red She-Hulk. Now that Red Hulk absorbed Banner's Hulk, together with the energy he absorbed fighting Thor, the Silver Surfer, et al., the Red Hulk became the Intel's prime candidate to power the Intel's machinery. What, then, is the Intel's grand plan? They use the power of the Cathexis Ray, turning it upon the Red Hulk, in so doing empowering not only a legion of A.I.Marines (another eyeroll-inducing name, courtesy Jeph Loeb) on an Arizona military base, and apparently another legion in Washington, DC, but also three teams of super-heroes invading the Hellcarrier with the ability to become Hulks. And Red Hulk states the Intel's plan is to use those Hulks to stage a military coup of the U.S. government. Incredible Hulk #608, on the other hand, shows things from Banner's perspective. First, there's a rescue mission on an Arizona military base, where Banner apparently tries to rescue his wife, Betty--and runs into the believed-dead Colonel Glenn Talbot, who his BannerTech tells him is not a robot. At the same time, as the Intel watch the footage of the event, they are attacked on board the Hellcarrier--by Banner and his Avengers! Amadeus Cho has been using an image inducer to pass himself off as Banner...and, of course, Betty (who prefers "Miz Ross" to "Miz Banner) clocks Amadeus anyway, escaping with Talbot, who locks her into a secure bunker meant for the President before teleporting himself away. While trying to open the door, Cho talks with Bruce--who also states Talbot should be dead--and Cho refutes that he heas found evidence of Talbot being part of a black-ops program, but doesn't complete the thought. In short order, Bruce meets with Lyra, making it clear she's on his side (but where is Jen?) and Skaar confronts Bruce about working with Red Hulk. Bruce explains that he's deceived and used everyone--the Avengers and Skaar--in order to save the world and Betty--"because if any of you knew all the different angles I'm playing...you'd never trust me again." He also states that if his plan succeeds, Skaar will get his chance "to get the only thing [he] ever wanted from [Banner]." Then, of course, the excrement hits the fan: Red She-Hulk shows up, attacking the Avengers and impaling Skaar with his own sword. Bruce manages to disconnect Reed and the others from the Liddleville device. He expects the Intel's plan to fail, but then the Cathexis Ray goes operational, transforming the A.I.Marines into Red Hulks, ready for their march on Washington. Skaar attempts to round up Bruce and escape but is thrown clear of the Hellcarrier, and Bruce sees mutated, Hulkish versions of Wolverine, Namor, War Machine and Captain Marvel...before everything fades out, one year later, and...well, my spoilers are just going to have to stop there! I do think the storyline is getting slightly silly (okay, maybe more than slightly), but it does seem we're going places. As both events occur at the same time, I think it's quite safe to state that Talbot is not the Red Hulk (unless the one seen with Cho and Betty is some kind of doppelganger that an EMP can't incapacitate, which I doubt). However I'm happy to say it still seems possible that Betty is the Red She-Hulk. It's only once she's seen for the final time, locked (?) in the bunker, that Red She-Hulk appears. Yes, it may be a false lead (She-Hulk, I am loath to admit, was nowhere to be found in either issue), and we may be picking up on exactly what Greg P. wants us to pick up on, that's true. But who makes a better fit for the Scarlet Smasherette at this point? Especially when considering what MODOK's said in the backup feature. At this point, yeah, I'm asking "What now?" and "What the #@!&*?!" as well as "Why does Deadpool have to be in absolutely everything?" There were some strange pieces to this story...was Banner in a part of the ship immune to Hulkification? And why were the Intel draining the collective smarts of everyone? How much did they succeed? For that matter, why tease the eight smartest if they only used six? Bottom line, I do want to see how everyone gets out of this situation, and that, I suppose, is "mission: accomplished" for "Fall of the Hulks." Now, on to "World War Hulks"...with, of course, a few more parts of "Fall of the Hulks" coming at us over the next month and a half to finish things up. As far as Red She-Hulk goes.. this is the first time I've slightly wavered on the whole Betty theory. Just like you mentioned, because of Jen's absence. I would like to point out, that the Betty we're seeing has been very violent and unstable. She punched Bruce/Cho twice. Not a slap, but a punch. It just seemed odd to me, like something someone with Hulk issues would do. A normal human I would see pushing, slapping, or kicking. Maybe I'm reading too much into things. As for where Betty was stashed, I initially took it as Talbot knowing everyone on board would be bombarded, so he put her into a saferoom. After all, who knows what effect it would have to Cosmic Gamma someone who's already Cosmic Gamma'd? It's also worth mentioning the security locks in place. The Leader and MODOK hidden away behind adamantium walls seemed on the same level as the rune lock stuff. 2) She's being placed in the room with MODOK/Leader -- presumably who trigger the brainwashing/gamma form and release her on the heroes. The only drawback with 2) would be that it requires Betty to not freak out at the MODOK/Leader -- based on her speech to Cho, I don't see it -- unless she's being brainwashed/controlled. Also, Talbot leading Cho right to the front door would be a tactical mistake. Anyways, finally, I'm starting to warm to Talbot. Yes, he starts out with cardboard characterization, but maybe it's because of his threat to Cho and his resemblence to Brian Banner that's responsible for that. Gary, I pretty much agree with everything with you said. The problem is that they should have at least answered some of the questions here. Or at least the identity of the Red Hulk. Yes I agree that Ross is the Red Hulk. I said before on another board that they wanted to use the cosmic/gamma energy to make soliders. That was right. I had thought Tyrannus's technology was used to create the new hulks. That was wrong. P S. Do you Domino is LMD? I doubt the Intel would allow anyone to know Red Hulk's real identity because it could lead to trouble for them. Zeno, thanks for saying that. I do feel that too many answers have been withheld for far too long. In fact, it seems like the majority of the answers from questions that've accumulated since the beginning of the Loeb run are being answered in, of all places, Jeff Parker's RED HULK miniseries, where IMO they have no right being answered. If you don't have the time, space, or talent to answer the questions in one of the two core titles, then for God's sake, don't ask the questions in the first place. It's also one quickly growing gripe I have with the whole "Fall of the Hulks," in that all the 4 titles that are trucking through the storyline overlap in a very tightly-knit (perhaps too tightly?) continuity, taking place over several hours and focusing in on the actions of a chosen few characters who are everywhere doing everything. Follow this character through this book, then that one, a panel here, a panel there, then oops, there he goes over here again, but wait! he's back over there, etc. For those who don't have the time or patience to stitch continuities together....well, I can imagine those people would be reaching for some Excedrin. It's a problem symptomatic of all of Marvel that Brian Hibbs wrote magnificently about in his "Tilting at Windmills" column at CBR. These families of comics are just ridiculous and incestuous, and besides that it seems that Marvel and DC just cannot schedule everything to be released at a pace that is reasonable and affordable on a regular basis to the average consumer. Those are my real issues with "Fall." Your mileage may vary. No arguments from me,Gary. On another site I said the exact same thing about Jeff Parker's Red Hulk. It is almost like they asked him to write the series fix all the plot threads that Loeb didn't know what do with. In terms of doing that Jeff Parker has done a excellent job with what he's been given. I guess it's too bad another mini series took the name Damage Control. Speaking of Parker I picked up Savage She Hulks 1 and it didnt impress me. Lyra could be a good character but now she just seems like a excuse to make extra money for this event. By the way what do you think about what I said about Domino. Feel free to disagree with me. I think Domino was probably the genuine article. It would seem strange that X-Force, especially with two trackers like Warpath and Wolverine, wouldn't be able to spot the real Domino from a fake. Good point about Wolverine especially since he can indentify scents. He messed up with Phoniex/Jean Grey but here we have robot vs organic matter.Unless they could fake that too, but it would be a strech. As for that scene with Domino,it seemed pointless and in bad taste. I sense you agree with me.